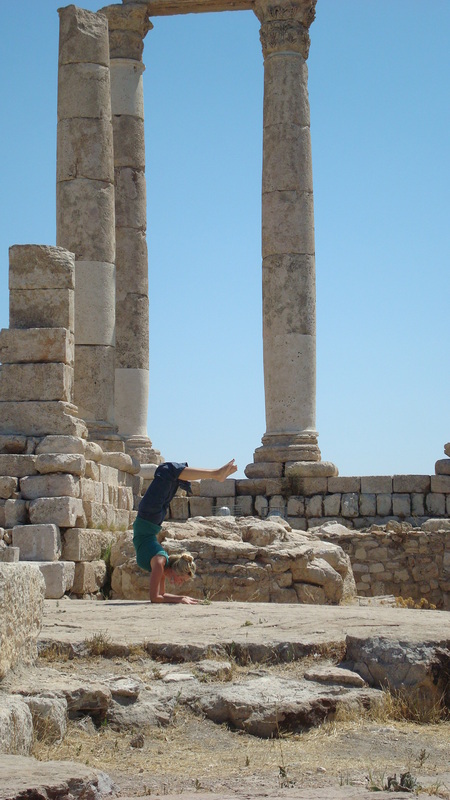 Last year for Christmas we were in Cairo…this year Alexandria–not Egypt, but Virginia. As a result, last Christmas Eve, we promised to do next year’s Christmas BIG…well, not that big, but anything is bigger than last year. What a difference a year can make. Check it out…I’m pretty pleased…but now I have more pressing things to do, like unpack our final shipment of furniture and such from Jordan that arrived yesterday. 1. I created a template from thin cardboard, fashioned after a picture of our house. The bay window on the third floor in my attempt at perspective. This picture is really just to show off my new mixer. 3. 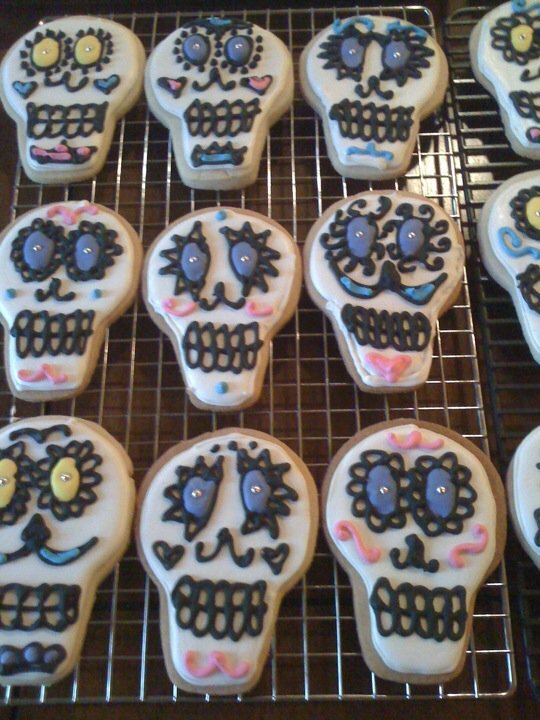 Roll out the dough; place template pieces over dough to cut out shapes; bake. 4. Here’s my favorite part. I smashed up butterscotch candy to melt into the windows so that they would light up. 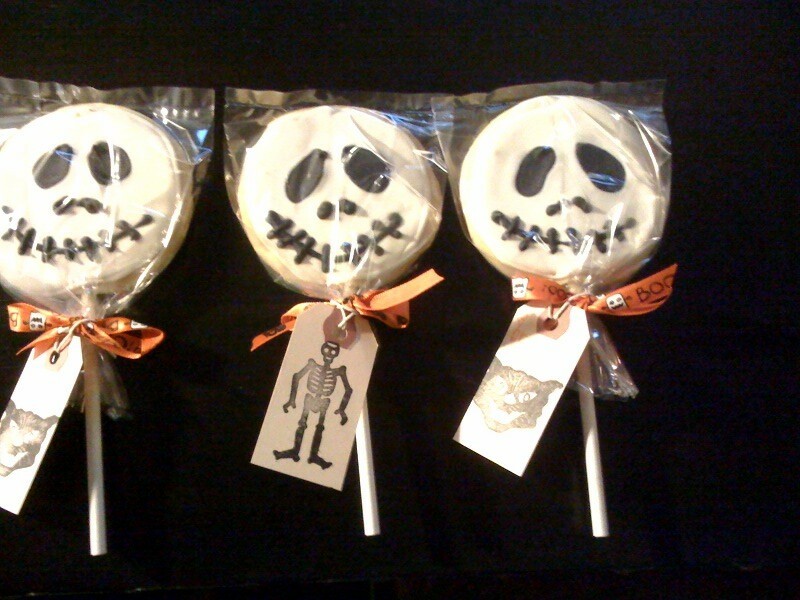 Place smashed candy into window and bake at 350 degrees, watching closely until melted. 5. Assemble all of the pieces. 6. Assemble the house using royal icing as the glue. This step got a little dicey with no one to help hold the roof into place, resulting in a slight slope. I cut out a square on the back of the house and placed a battery operate tea light like this one into the center to illuminate the stained butterscotch glass windows. Here’s the recipe that I’ve perfected through trial and error. It only takes a few minutes to prepare, requires about six hours of sitting on the counter to ‘bloom,’ requires another hour of rising in a loaf pan, and then one more hour in the oven and you’ve got yourself a fresh loaf of heaven. 1. Combine all of the ingredients in a bowl. Mix and fold all of the ingredients, making sure that all of the flour at the bottom of the bowl is blended. The consistency of the dough is very wet and sticky, no need to fuss over it. Spray the top of the dough with cooking spray. Cover the bowl with plastic wrap and leave on the counter for at least 6 hours or overnight. (I’ve accidentally left it out for more than 18 hours and it still turned out great). 2. 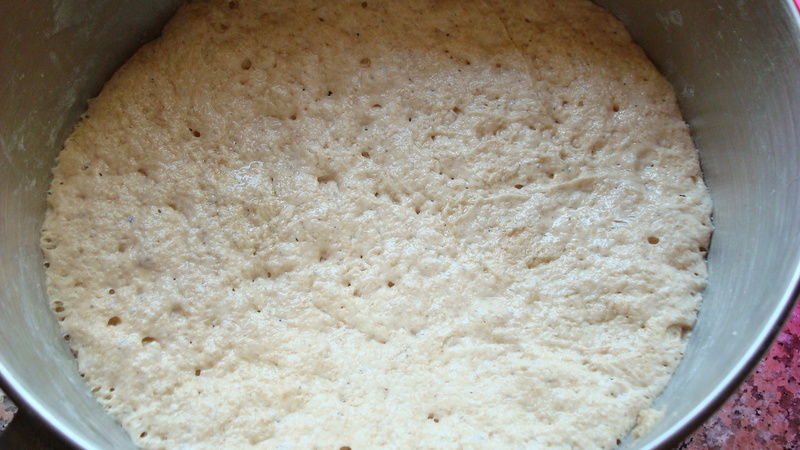 After about 6 hours, the dough will be a little bubbly and will have risen close to the bowls upper edge. Spray a rubber scraper with cooking spray, fold the dough in towards the center to release it from the bowl’s edges and scrape the dough into a prepared (with cooking spray) loaf pan. Spray the top of the loaf with cooking spray, cover with plastic wrap, and let rise for about an hour, or until the dough rises over the top of the edge of the loaf pan. 3. Remove the plastic wrap from the risen loaf, preheat the over to 350 degrees for about 15 minutes. 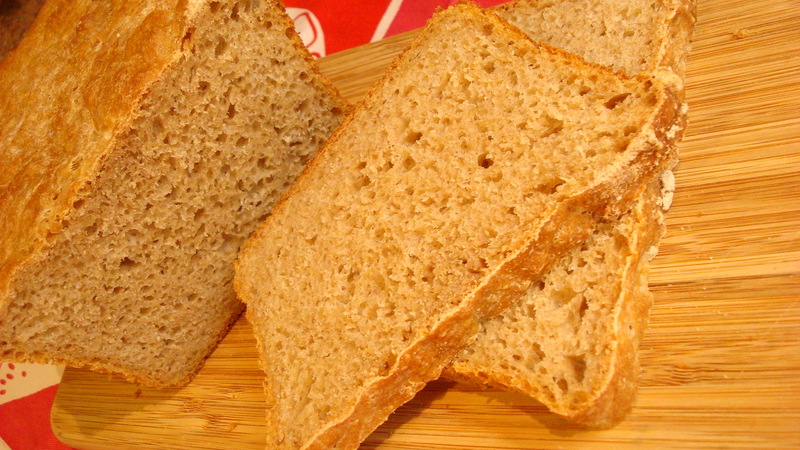 With a serrated knife, slash a line down the center of the bread; sprinkle with the top of the loaf with about 1 tablespoon of whole wheat flour. Place the loaf in the oven and bake for approximately 60 minutes until the loaf is golden brown and sounds hollow when you tap it. 4. 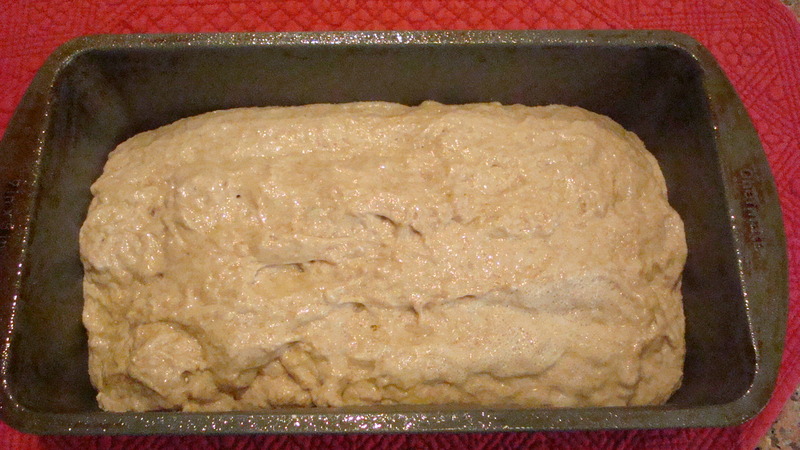 Allow the loaf to cool for about 10 minutes before removing the loaf pan. 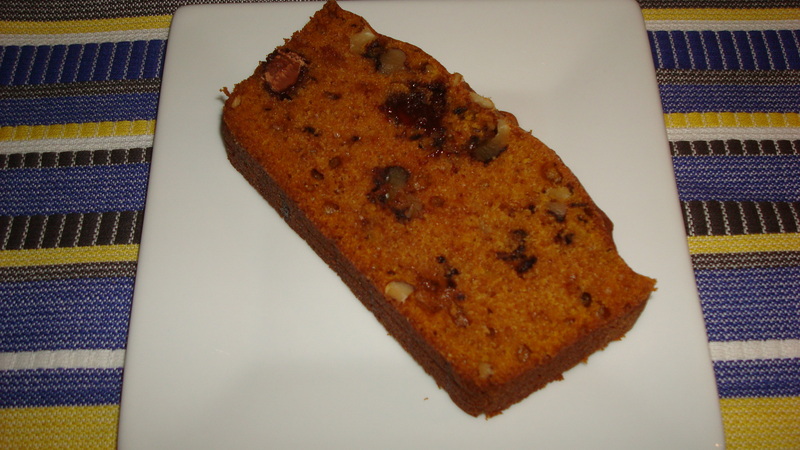 Pumpkin bread, like banana bread, is one of the simplest and least fussy recipes I know. You basically ‘dump’ and mix all of the ingredients together in a bowl, place the loaf pan in the oven, and an hour or so later, you’re treated to a delicious smelling kitchen and a rich and spicy piece of heaven. However, when you’re in Jordan (and let’s not forget there’s always a snag or else this blog wouldn’t exist) finding canned pumpkin puree (even during the Thanksgiving season!) is near to impossible. Lucky for me though (and Raj), I planned ahead in the event something like this were to occur–I packed (way back in April) one 28 ounce can of leftover pumpkin puree. Knowing now that I cannot find canned pumpkin anywhere else, pumpkin pie is off the Thanksgiving menu this year. I need to save the remaining leftover from the can for the next (and sadly) last pumpkin loaf we will eat this fall. 1. Preheat oven to 350 degrees and position rack in the center. 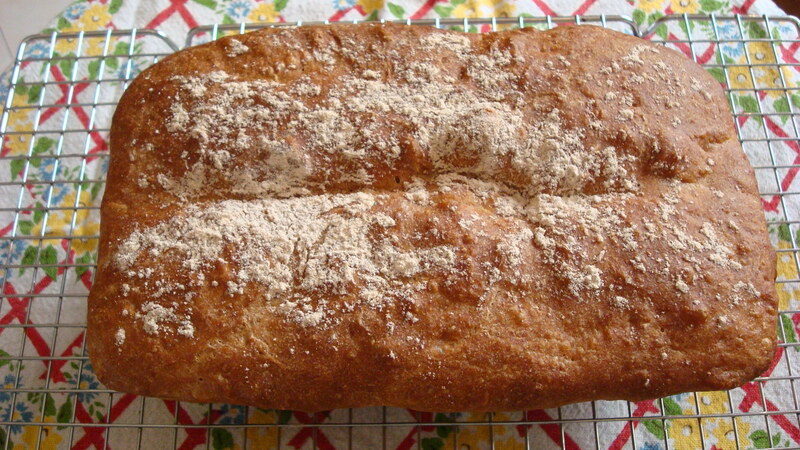 Lightly coat a 9-by 5-inch loaf pan with Pam or other oil spray. In a large bowl, whisk together the flour, baking soda, cinnamon, allspice, cloves, ginger, and salt until thoroughly blended. In a medium bowl, whisk together the eggs and water. Add the sugar and blend well. 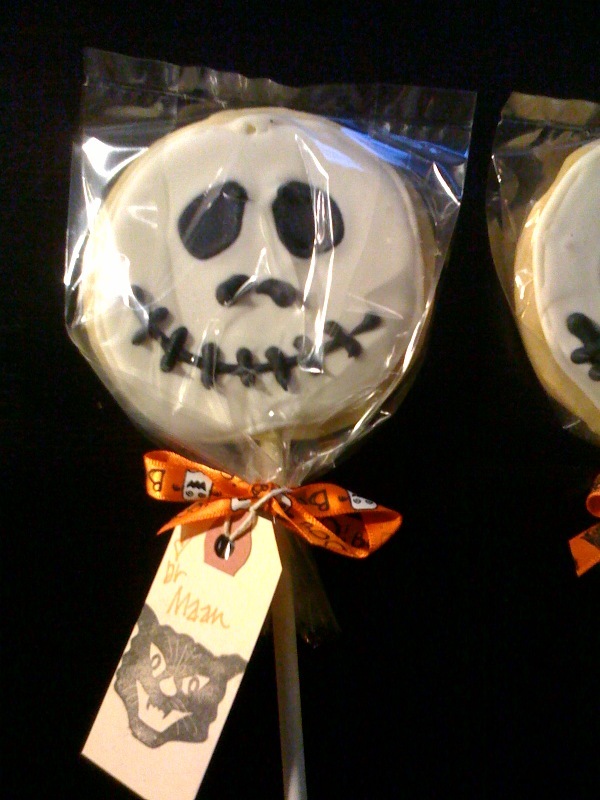 Add the pumpkin puree, canola oil, and vanilla extract and blend well. 2. Add the pumpkin mixture to the dry ingredients and whisk until blended and smooth. Add the walnuts and chocolate chips until they are evenly distributed. 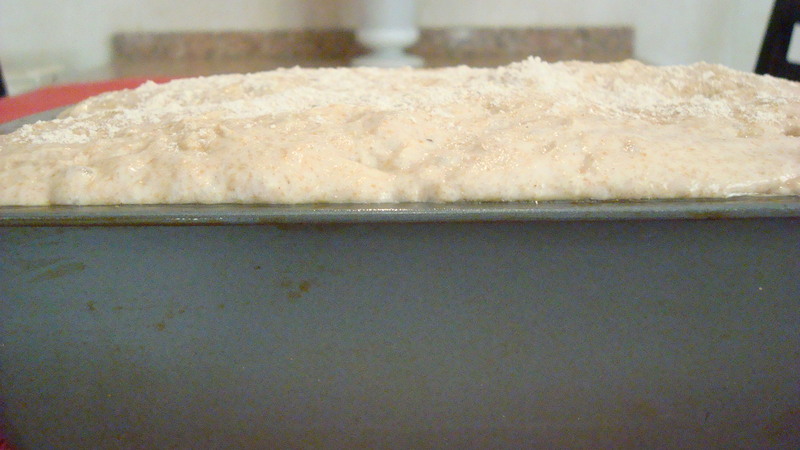 Use a spatula to scrape the batter into the prepared loaf pan and level the top. 3. Bake for 55 to 65 minutes, until the bread is firm to the touch and a toothpick inserted into the center comes out clean. Transfer to a rack to cool completely. It’s been awhile, I know. I’ve missed blogging and feel as though I’m just coming up for air after a long stretch of weekend teaching (just the last two weekends). As a result of ‘working,’ something that I haven’t done for a while, I’ve been neglecting my domestic duties (as Raj points out every time he opens the refrigerator door). 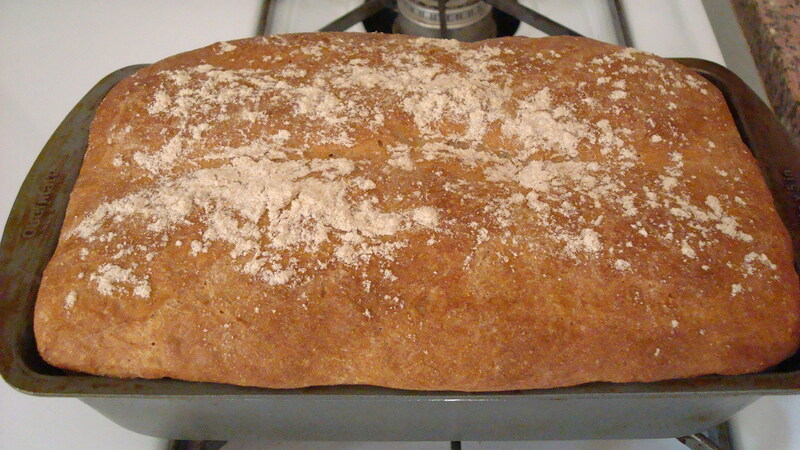 What better way to jump back into the swing of things than with home-made bread. Want to be a hero or a goddess in your home? Bake this bread NOW. There’s nothing quite like the smell of freshly baked bread wafting through out of kitchen and into the rest of the house (apartment in our case). Now you may be thinking that bread is for bakers (which I aspire to be) and a baker you are not? Never fear! This fabulous book that I’ve just recently cracked open (one of the few to travel with me) makes baking fuss-free and requires no-kneading. Is that even possible? Yes. The secret to this book is through letting the dough slow rise, which allows it to knead itself (it’s magic!). Additionally, most of the recipes are made in one bowl with one spoon–a dream come true for those unfortunate few like myself who lack domestic help (alright, I do have help, but only one day a week) or a dishwasher (I’m still dealing with this one). For this particular loaf, I used a large Le Creuset pot. 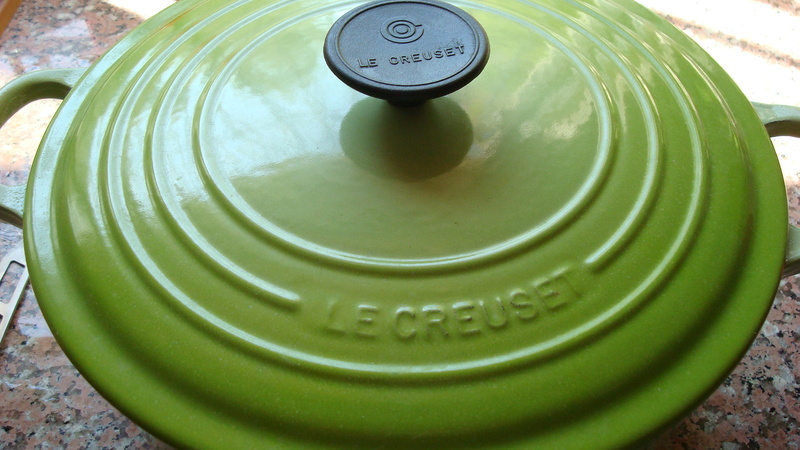 I was worried about placing the lid in the over (it has a plastic knob) because the manufacturer claims it can only be heated to 350 degrees and this recipe requires 400 degrees. I’m happy to report that the knob was fine, so you needn’t worry about ruining your $250 pot. 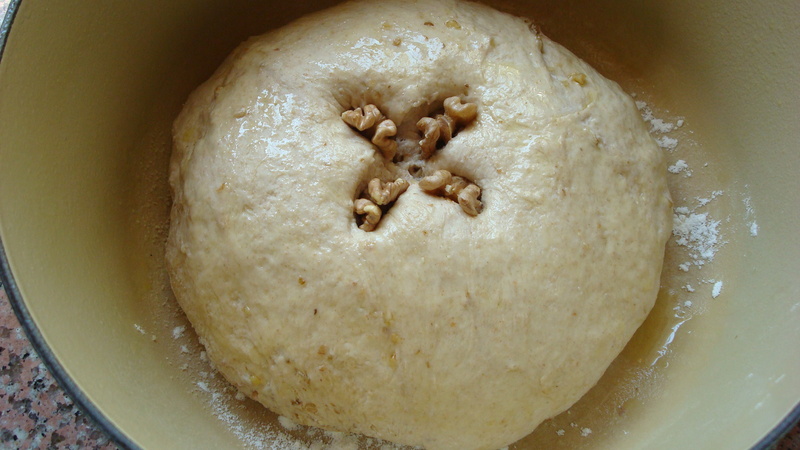 First Rise: In a large bowl, thoroughly stir together the whole wheat and white flour, sugar, salt, and yeast. 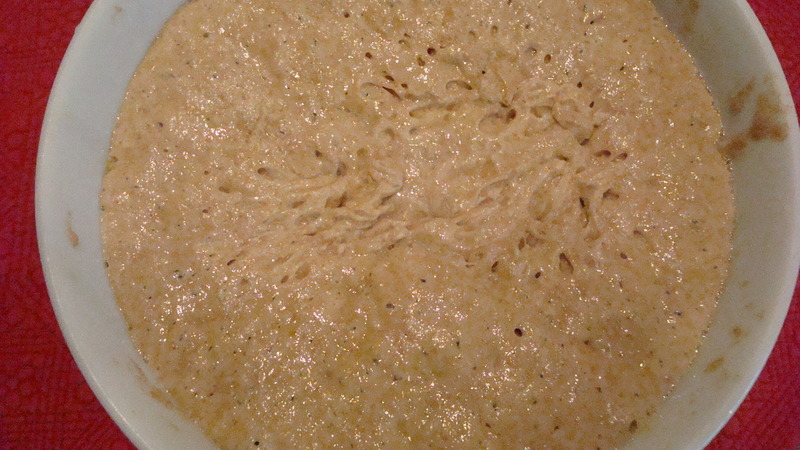 Vigorously stir in the water, scraping down the bowl and mixing until the dough is well blended and smooth. If the mixture is too dry to incorporate all the flour, a bit at a time, stir in just enough more water to blend the ingredients; don’t over-moisten, as the dough should be very stiff. Brush or spray the top with oil. Tightly cover the bowl with plastic wrap. 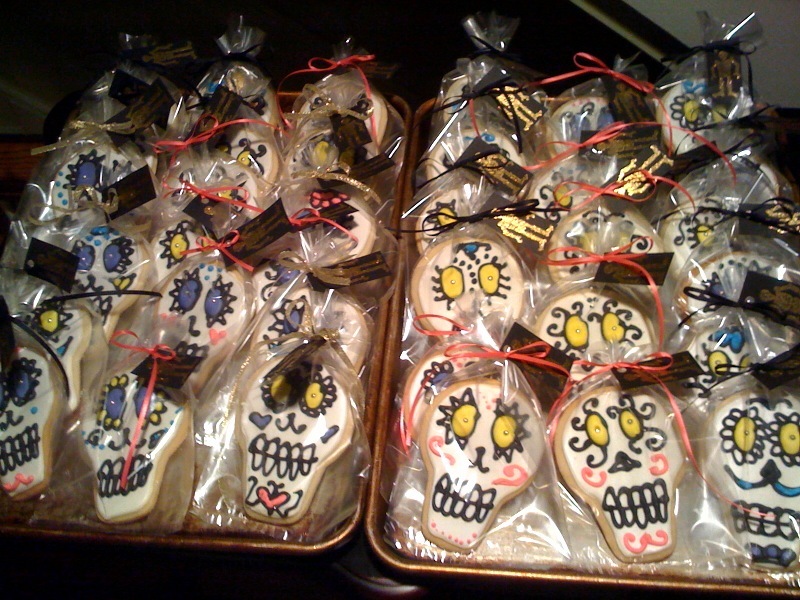 If desired, for best flavor or for convenience, you can refrigerate the dough for 3 to 10 hours. Then let rise at cool room temperature for 12 to 18 hours. Meanwhile, reserve 4 perfect walnut halves for garnish. Spread the remainder on a baking sheet and lightly toast, stirring several times, in a pre-heated 325 degree oven for 10 to 15 minutes, or until fragrant and just lightly browned. Let cool. Chop finely (in a food processor, if desired). 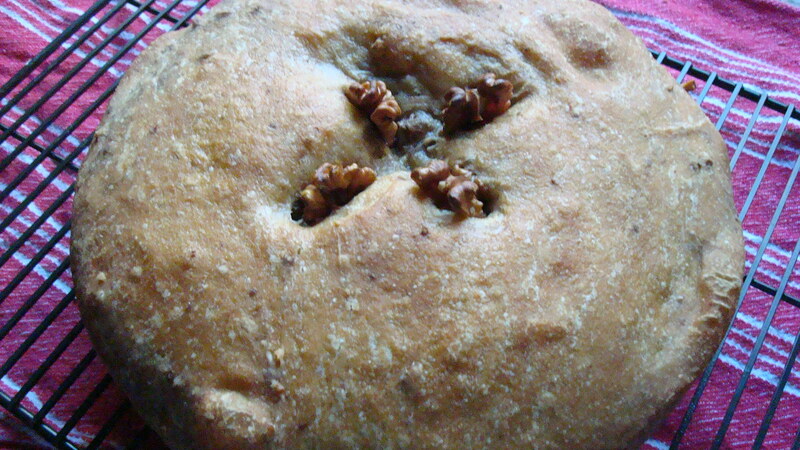 Second Rise: Vigorously stir the cooled walnuts into the dough. 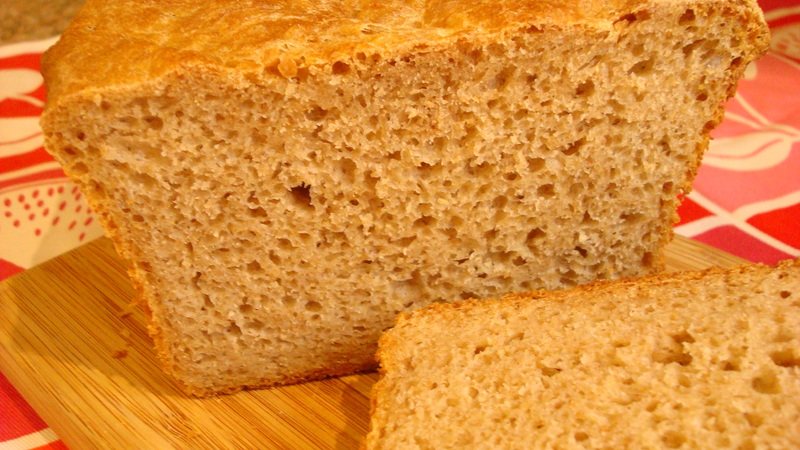 If it is not stiff, stir in enough more whole wheat flour to make it hard to stir. Using an oiled rubber spatula, lift and fold the dough in towards the center, working all the way around the bowl. Invert it into a well-oiled, then flour-dusted, 3-quart (or larger) heavy metal pot (or use a flat-bottomed round casserole with a lid). Brush or spray the top with oil, then smooth out the surface with an oiled rubber spatula or fingertips. Cut 1/2-inch deep slashes to form an X in the center top; well-oiled kitchen sheers work best. Put the 4 untoasted walnut halves in the angles of the X for garnish; press down very firmly to embed them. Cover the pot with its lid. Let Rise Using Any of These Methods: For a 1 1/2 – to 2 1/2-hour regular rise, let stand at warm room temperature; for a 1 – to 2-hour accelerated rise, let stand in a turned-off microwave along with 1 cup of boiling-hot water; or for an extended rise, refrigerate for 4 to 24 hours, then set out at room temperature. 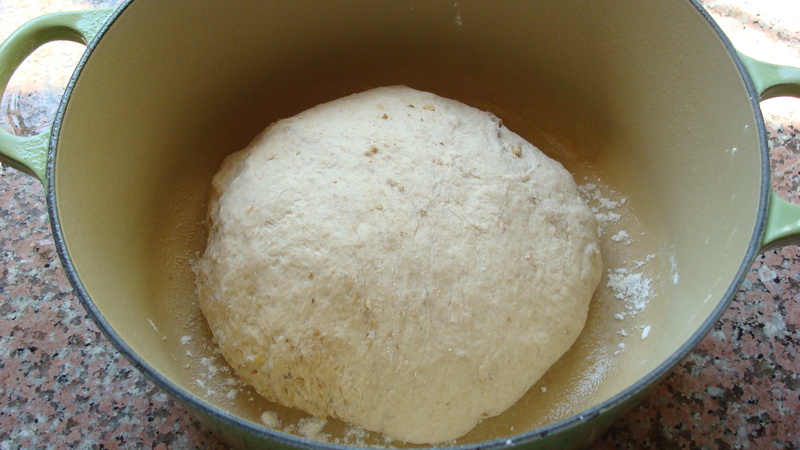 Continue until the dough doubles from its deflated size. Baking Preliminaries: 15 minutes before baking time, place a rack in the lower third of the oven; preheat to 400 degrees. Lightly dust the dough top with whole wheat flour. Baking: Bake on the lower rack, covered, for 45 minutes. Remove the lid and continue baking for 20 to 30 minutes, or until the top is well browned and a skewer inserted in the thickest part comes out with just a few particles clinging to the bottom (or until the center registers 207 to 210 degrees F on an instant-read thermometer). Then bake for 5 minutes more to ensure the center is done. Cool in the pan on a wire rack for 10 minutes. 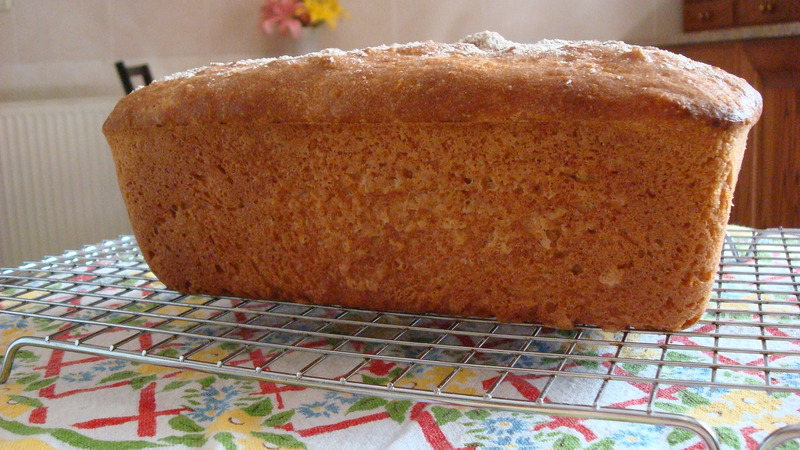 Remove the loaf to the rack, running a knife around the edges to loosen it, if necessary. 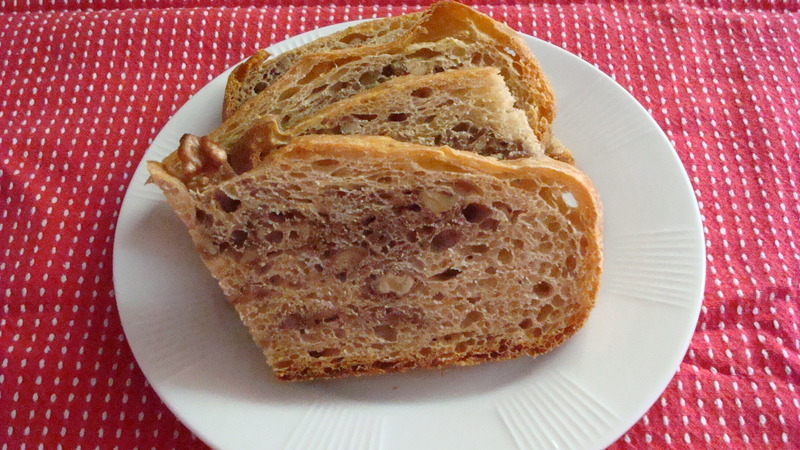 Serving and Storing: The loaf tastes and slices best at room temperature. Cool completely before storing airtight in plastic or foil. 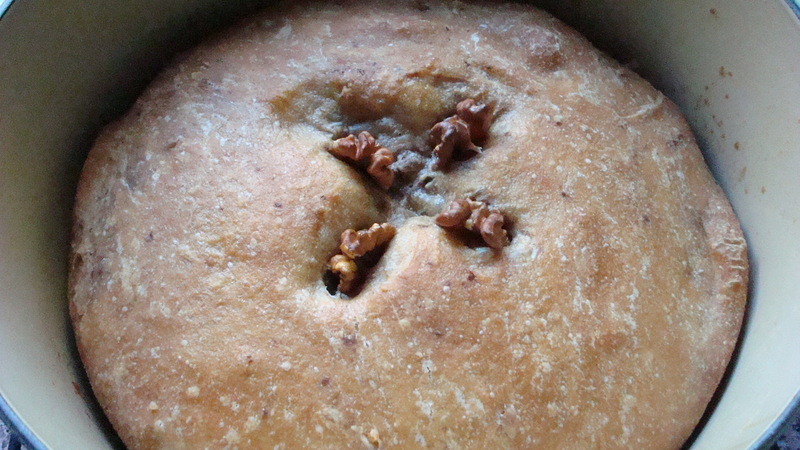 The bread will keep at room temperature for up to 3 days, and may be frozen, airtight, for up to 2 months. Pop-Quiz: How Do You Convert a Stick of Butter to Tablespoons? You’re living in Jordan. 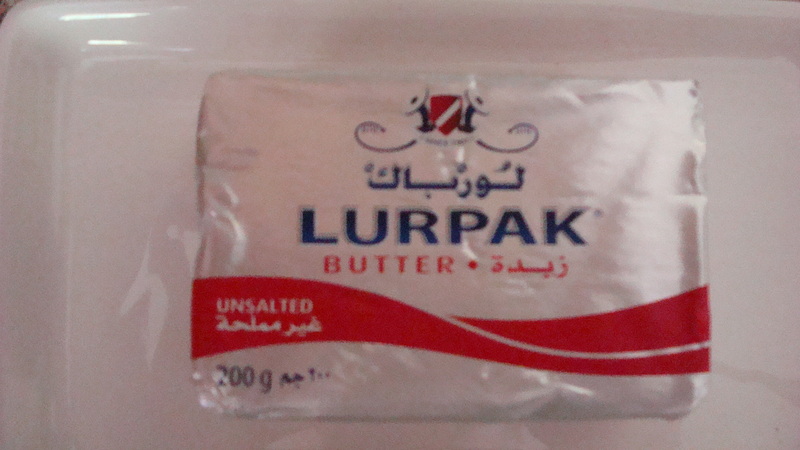 You like to bake and are used to using unsalted sticks of butter like the one below. Notice anything different about the stick of butter? The size? The width? The package? Say you want to make chocolate chip cookies for your STARVING and sweet-deprived husband. You need 10 tablespoons (or 1/2 cup of butter, plus 2 tablespoons). Normally, you’d use one stick of butter (equalling 8 tablespoons) and cut two additional tablespoons from another stick, right? You buy what look like ordinary sticks of unsalted butter at the grocery store, but…there’s always a but here….you open up the packaging and are puzzled. 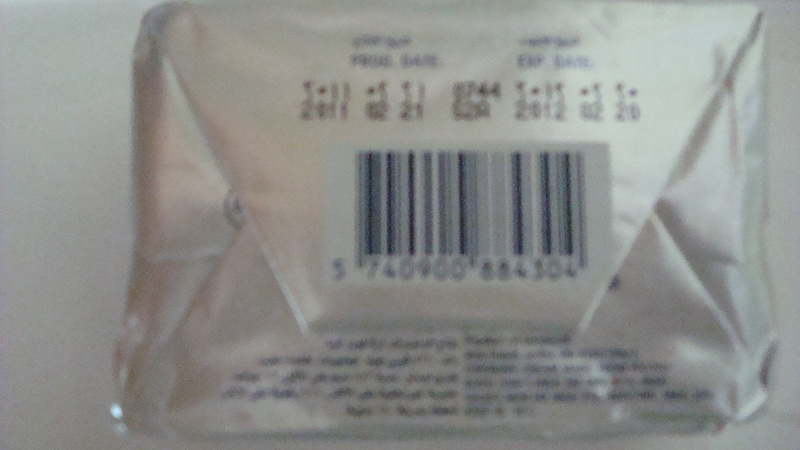 There ARE NO TICK MARKS on the packaging to indicate the measurement of butter. What do you do? a. You get out a tablespoon and manually measure the butter (all 10 of them, what a waste of time and end up making a BIG mess–remember, you don’t have a dishwasher, either). b. You make an estimate, knowing full well that you may have wasted PRECIOUS ingredients that are hard to come by here (chocolate chips) and are insanely expensive (pure vanilla extract–kept in the safe next to the salami). c. You attempt to get resourceful and create your own measuring device. d. You cry and get upset that your husband made you come here to the land of butter without measurement. e. You _______________ (fill in the blank with your own response). Here’s my first attempt at creating my own measuring guide. It worked for the single-wide sticks, but threw me off on the BIG-DADDY, double-wide sticks. 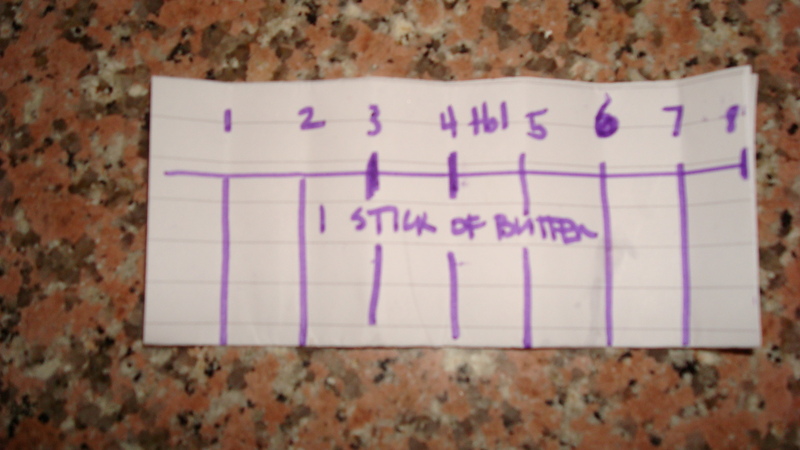 The next conundrum: how to measure a double-wide stick of butter. Luckily for me, my sister had forwarned me prior to moving (and based on her experiences cooking in Italy) that I’d need a scale for measuring ingredients. 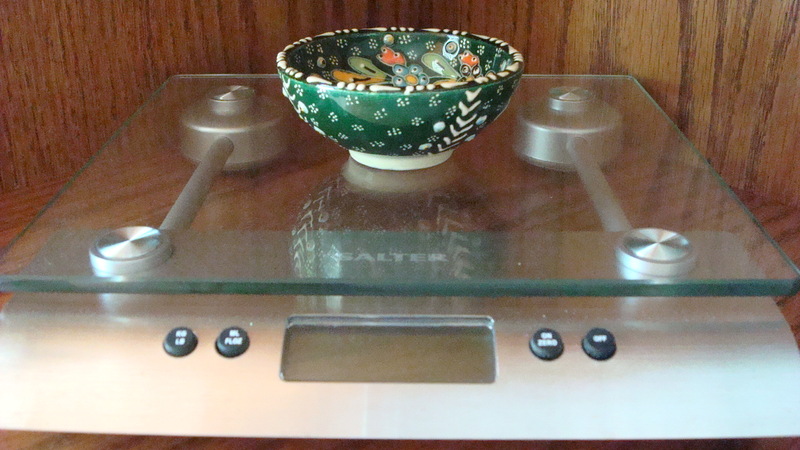 I bought the scale a while ago, threw it under a cabinet, never to be seen, until the butter threw me for a loop! 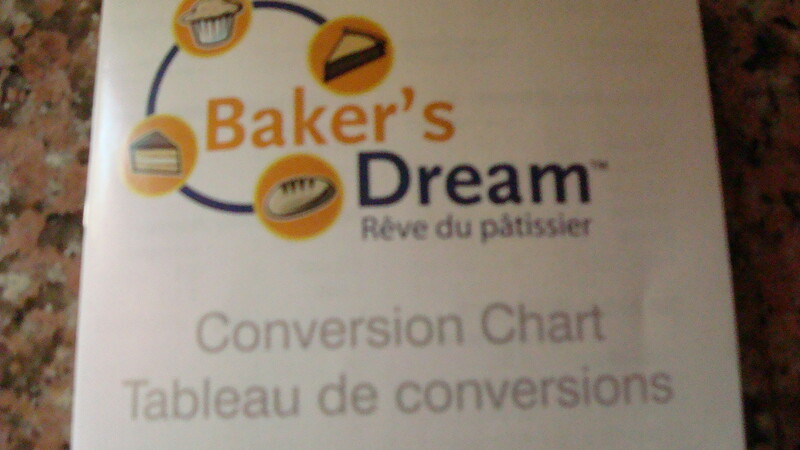 As I was unpacking the scale I discovered, to my utter delight, a conversion booklet for all sorts of things. I flipped to the page titled “fats” and hit pay dirt. OMG! Hallelujah! Now I’m able to accurately measure my butter (along with other “fats” using the scale). Problem solved, for me at least, so I suppose the real pop-quiz here is: How do Jordanian’s convert their sticks of butter into tablespoons? Love! Love! Love my scale!! !